We take something that is dirty and ugly in the corner. This old wagon is broken and they are using as a prop in the corner. We light it is an unusual way to hide the ugly and create interest for your eye. Learn to look at the building find things to enhance the room around you. 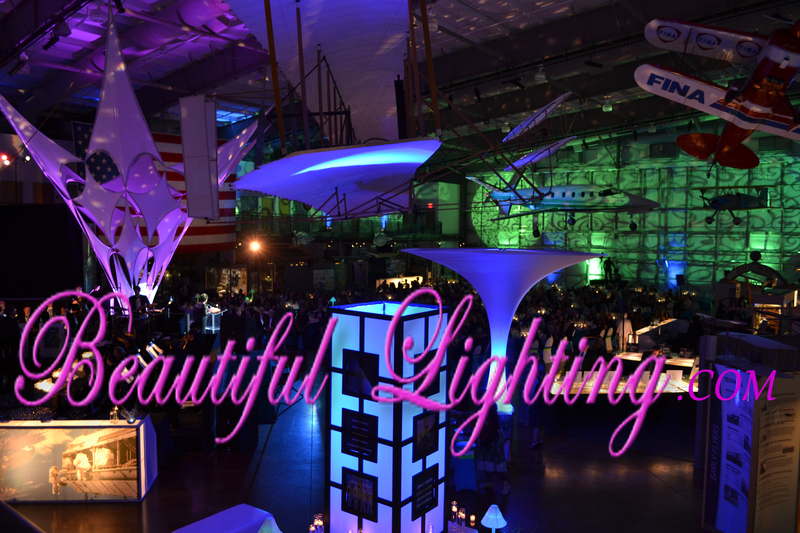 Lighting is the most affordable way to decorate your event. Lighting goes further and cost less than other mediums. 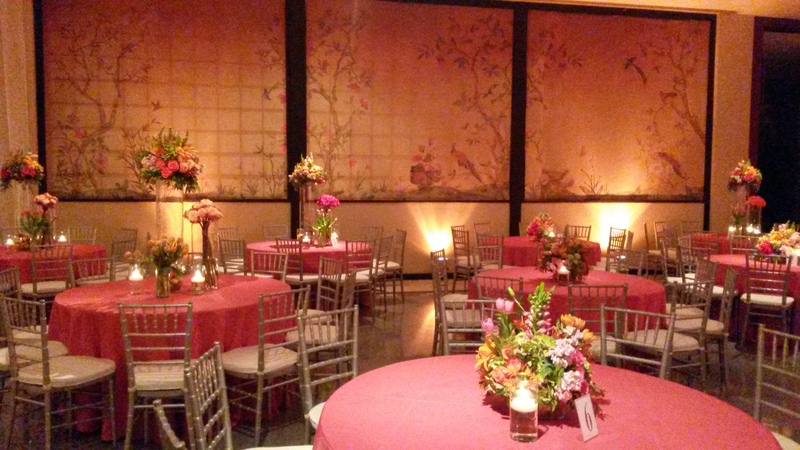 Lighting hides the dirt and bugs these wedding venues never clean up. I am often on the floor taping down the cords and we get just dirty because they do not clean up the halls before their brides weddings. Brides don’t let this happen to you. Put it in the contract. Ask them to clean up and have a family member do an inspection. 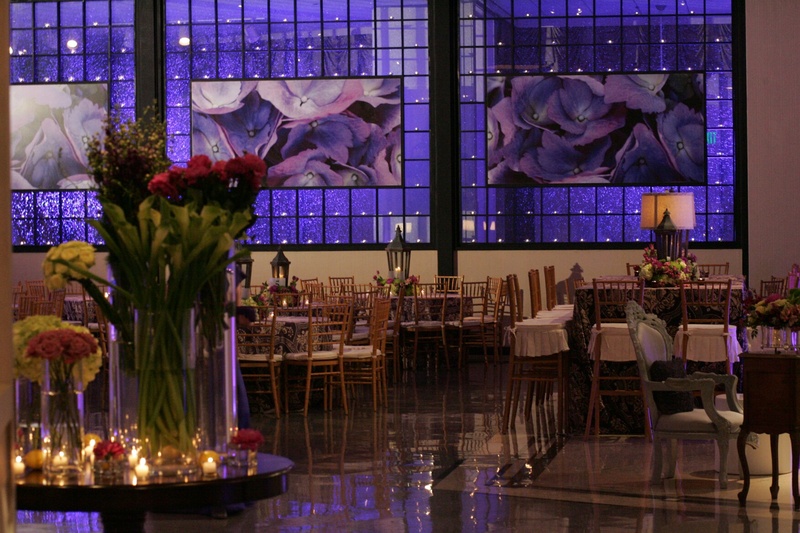 It is important to choose the right color for your wedding. Below are some of the unexpected reasons to consider. just don’t look good in Blue and green. I always cringe when I see wedding colors of sea foam on the internet. Fortunately they or not the photographer shoots a perfect room before the guest arrive. This does not let you see how you and your guest may look in green light. color. I do this for all of my brides so they can see what the real light looks and feels like. Look at the color on your table cloths. Do you like the way it makes the fabrics look? So what colors have I had the most success with? First off candle light is beautiful. Everyone looks good in this color. it does tak a quality light to get this color out of leds. We have been doing a lot of peach with is very pretty. It is a little hard to get the color perfect on film. The best color I have worked with to date is lavender. It photographs perfect and everyone looks good in this color. 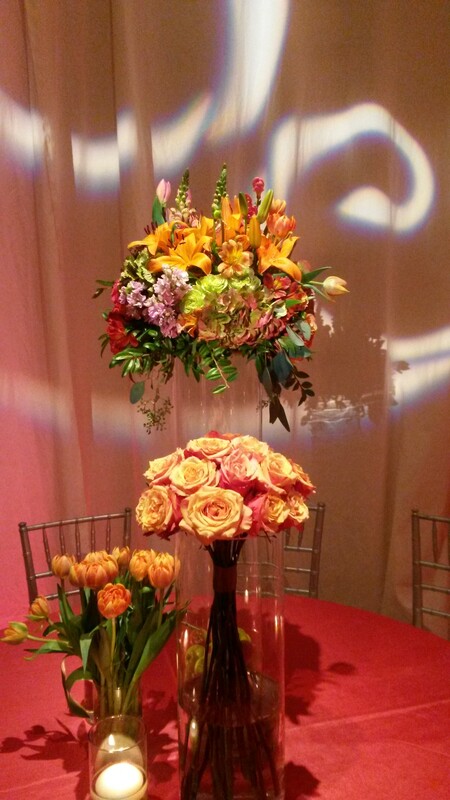 As a bride I might even think of using 2 colors after all your flowers are different colors. how ever you plan it get a lighting person who will bring out equipment to show you. I do this because lighting is a visual art not everyone sees what I see. It is my job to show them. And I honestly love to show my trick s.
“Let there be light, and In the beginning..from there I am sure the day gets better and better for the sound guy who has to stomach comments. Lighting guys always includes cute statements on there emails and business cards. While sound guys are much more concerned with the room The lighting guys care more a what is going on behind the mic’s often its just simple beamage they are looking at. While I love running a console I am at heart a Lighting girl through and through. I still can feel sorry for the sound guy who has to put up with our egos. Sadly today’s technology has taken away the victory of the hunt the love for the live action I have for the Concert Lighting. Now the Lighting designer sits in a room and programs the “Tour”. Once it is on the road the Lighting operator is a mere button pusher. If you have ever ran a console it is like a life size video game. You can sit off stage and play with the band. So often they would give me hand signals making me part of the show. Later they would come tell me how much fun they had on stage while I was running the show for them. It’s all ego, the most exciting feeling I have every had. I know that at the end of a well planned show I could conspire to have the crowded worked into a frenzy and on their feet. The love of the art run deep in the heart of a creative soul. I loved it and Lived it. But in today’s high tech world you need no talent to push a button. After 9 years I had to decide if I wanted to just get by doing what I loved or if I would chance to excel at what I do. With great passion for my art I had the drive and made the opportunity to exceed. It is not a given it is a daily fight for the opportunity to do what I love. So if you are a sound man I swear I will give you Credit. You are the important part of the show. Because with out the sound we would be just all standing watching lights flashing. Thank you for all that you do. This is a Quote from The famous Event Planner David Beahm. I almost forgot! While I’m on my soap box: there seems to be a rather annoying trend on the elegant/professional lighting landscape – the L.E.D. lighting fixture. L.E.D.s are inexpensive to purchase, are extremely versatile because they can blast myriad of colors with the push of a button and (in many cases) require only a battery, thereby doing away with the need for miles of wiring. Suddenly, every company with a little spare change in their pocket could purchase them and has been saying, “we can provide your lighting for you.” I’m here to tell you, no. They cannot. For years, professional lighting designers were able to create elegant spaces with the use of incandescent lighting. Event/temporary lighting brought about the need that things become more portable and easier to use, thus L.E.D.s have been employed to make life easier for lighting companies, shortening installation times and reducing bottom lines immeasurably. However, what few have taken into consideration with L.E.D. lighting is that it is harsh. Really REALLY harsh. It makes your eyes strobe. It does not blend elegantly with conventional incandescent lighting. To put it plainly: it makes the human skin look horrible. Personally, I believe one of the major functions of lighting is to make every person at the event feel that they look fabulous. If you are looking at your wife who is green or blue and the color temperature of the lighting has turned her beautiful “Jungle Red” lipstick into “Cadaver Black” (yes, lighting, especially L.E.D.s, changes the way we perceive color); you’re just not going to forget that. Changing technology has improved the type of light produced by modern L.E.D. fixtures, but they’re just not there yet. So, just like everything else that you purchase – buyer beware! L.E.D.s are wonderful to light architecture and give a colorful background to an inanimate subject, but make sure that you’ve hired a lighting designer who understands their limitations and how to make everyone and everything look beautiful. A bargain lighting company is probably going to give you a truly “unforgettable” look … don’t say I didn’t warn you.” David Beahm. I can not tell you how happy I was to read that. I have been Lighting since 1977 in high school all through college and still to this day. A true designer is only as good as the tools that he or she works with. I have some tricks and I know a lot about light, what it will and will not do. Here is how to fix the problem. Pinspot the money. What elements cost the most in the room? The cake mega dollars and those flowers must be lit. I light them every chance I can for weddings and I like to do it with flair. I love to pattern up the room with designs. I was told by an artist that you eye needs to see white every once in a white to see true color. I believe this. It is like being in a red room or blue. After awhile your eyes adjust and the color of things just look odd. The following picture is how I stopped the Led effect. Know that the photo was taken with my phone and not a true quality picture. Out door wedding can be beautiful. But please remember a smart bride has a back up plan. Last night I lite the most beautiful Wedding at Willow lake gardens. This was the most beautiful out door garden setting I have ever seen. Fauxcades creative Event Designs Had designed high back tufted chairs for the dinner garden set. As the guest we just starting to eat a rain storm ran every one inside. Thanks to the fast acting wedding Planner Patti Wagner, who directed everyone to move the chairs inside and let the party continue indoors. I had up lighting in the cabin but never thought anyone would see it. But when the back up plan became the plan everyone enjoyed! So always have a back up plan and rain option. In Texas the only way to predict the weather is to look up. I love fairy tale weddings. This one was a challenge because I wanted mix leds and conventional cans outside. We are talking about two different color temperatures. But the most difficult challenge was the yellow walls. It tends to give the fuschia color an orange tint. So the columns in the room were painted white. And I had to mix a different color for the yellow walls. Out in the garden, we strung garden lights. While I was installing the lights the temperature quickly rose to 103. The ladder was burning my hands and sweat was burning my eyes. Lighting designers weak point is their eyes for sure. 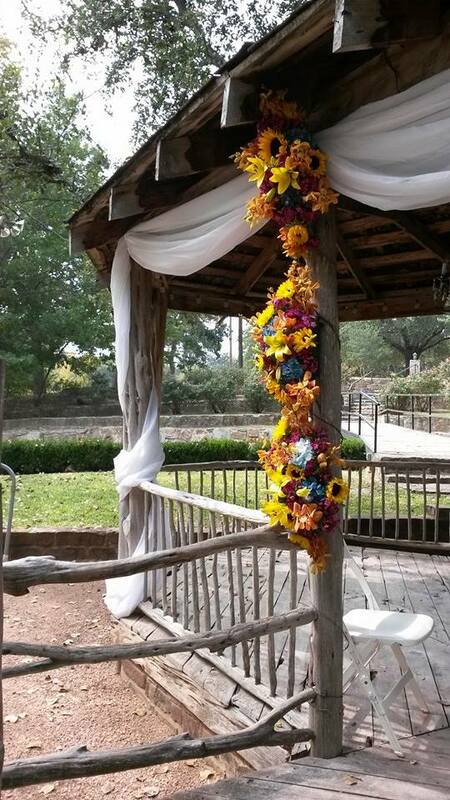 But it was well worth it the garden was amazing for the bride and groom. My last challenge of the night was my aluminum ladder and the flashes of light with rolling thunder from the sky. That night was a record breaking fast out. I am so proud of my team. I will get more photos to post from this event soon. Every year I am fortunate to Light the Frontiers of Flight Gayla. Many hours we labored over getting this event up. We had a team of Video engineers, a movie producer, and a Director involved to find the perfect look for their new film sponsored by Bowing.